T: I met Vanna at a meeting at which she was speaking on making effective presentations. I thought she would be a good person to collaborate with for EDI. Vanna wanted to give back to the Asian American community so we started discussing collaboration on EDI. 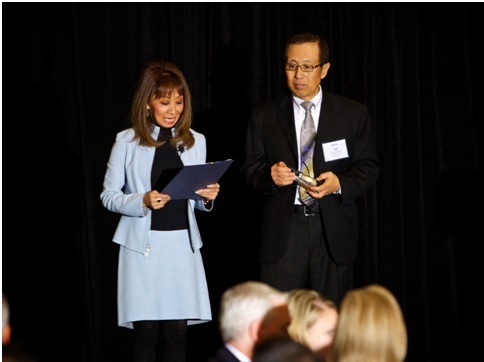 V: If I remember correctly, Ted saw me speak at a conference for the JACL. And actually, back then, I had no connection to our Asian community. It was because of Ted, that I agreed to get involved. I had no idea that it was going to be just the beginning of a long, but fulfilling journey. I owe a lot to Ted. Why did the two of you want to create EDI? T: EDI originally started as a special interest group under the Japanese American Chamber of Commerce. It was created to provide leadership training specifically for Japanese Americans, then it evolved to include all Asian Americans and now Hispanic Americans. Vanna agreed to be a co-founder to develop curriculum for leadership training. We wanted to also provide role models, mentors and create a network for career development. V: Ted recognized that there was a big gap between the numbers of highly qualified, competent, Asians within American corporations vs. Asian Americans in the executive ranks, and felt the need to do something about it. It was really his grasp of the situation and his vision, that launched plans to build a program like EDI. I happened to have the background to design our initial curriculum so when Ted asked me if I’d help to get EDI off the ground, I said yes. And the rest, as they say, is history. But people should know that EDI was Ted’s vision. What was your vision when it first started? T: My vision was to elevate Asian Americans into leadership positions at corporations, government, and non-profit organizations. I wanted Asian Americans to have the same opportunities as Caucasians and to level the playing field for leadership positions. I also wanted to have role models, mentors, networks, in place to provide support and encouragement to Asian Americans striving for leadership positions. V: I would say that that’s still our vision today and we now are working toward that same goal or vision with our Hispanic program. We still have a long, long way to go. How has its actual progress been compared to that vision? T: There have been many improvements and an increase in role models as leaders, yet there are still no top Asian American executives at companies like Boeing. The ultimate goal is to have more people of color in executive positions. I want them to have the same opportunities to excel and have a level playing field. V: I think that my initial vision was very narrow. What I’ve learned through having had the chance to work directly with all of our program participants over the years is that “progress” can be defined in many ways. So while we’re still far behind in seeing a significant number of Asians or Hispanics in executive positions, what I do see is our participants gaining clarity about what it takes to move into the senior ranks and making clear decisions as to whether they’re willing to do what it takes to move up. Or sometimes I see them becoming leaders within the community at large. I think that’s progress. And when their managers begin to gain an awareness and appreciation for programs like EDI and as a result, they begin to send more of their employees to our programs, well, that’s progress too. What was the biggest obstacle you felt you had to face during your path to establish EDI? How did you overcome it? T: The main hindrance I would say is just the administrative details of orchestrating EDI as I was doing it on the side as a service while working at Boeing. The first class was in 1994. Eleven participants registered. It was advertised by word of mouth through the JACC. It was originally for Japanese Americans but we are expanding it to all people of color as we all have the same issues. What would you like to see happen with EDI in the future? T: I would like to see EDI become a preeminent leadership organization in the future. I would like to see it create connections to top leaders, celebrate achievement in the community, and help all people of color reach leadership positions. V: Ditto! And in my wildest of dreams, I would love to see EDI do the work that it does so well, that we begin to have a global impact. I would also like to see us expanding our offerings. So maybe we’d offer our programs in different formats. More than anything, I would love to see us develop programs for other groups of color who are underrepresented. What do you feel is the biggest change in our participants after they leave the program? T: I see that graduates have more confidence. They are generally more strategic in developing their careers. They give back more to the community and have stronger networking skills. V: Honestly, I have witnessed profound changes in participants’ sense of themselves. For many, there is a huge leap in their level of confidence and a greater appreciation for their own potential and self-worth. I get to do the class at the front end of their EDI experience that deals with public speaking skills which can be so revealing in terms of one’s self esteem. So I get a pretty good sense of each participant’s confidence level coming into the program. Then I get to see them at graduation, and for some, the transformation in them can bring me to tears. They find the power within themselves that they’ve had all along and just wasn’t aware of. It becomes the tipping point at which they begin to take more risks and more responsibility to build stronger organizations and healthier, happier communities. It’s not magic. It’s a process that they work hard at throughout their EDI experience. Newer PostWelcome, Class of 2018!